Darts star Rob Cross enjoyed a welcome return to form today (Friday). The world champion from St Leonards won five matches to reach the semi-finals of Coral UK Open Qualifier 4 in Wigan. Those victories ended a run of six consecutive defeats in all competitions, which culminated in a 7-1 reverse at the hands of Simon Whitlock in the Unibet Premier League last night. Cross began the latest UK Open Qualifier with a 6-3 success against Christopher Bent and followed that with a 6-1 victory over Mike De Decker. The world number three then edged out world youth champion Dimitri Van den Bergh 6-5 in the last 32, repeating his narrow victory over the 38th-ranked Belgian in a thrilling World Championship quarter-final during December. Cross saw off 26th-ranked Scottish thrower Robert Thornton 6-3 in the last 16 before getting the better of Krzysztof Ratajski 6-4 in the quarter-finals. The 27-year-old’s progress was eventually halted by a narrow 6-5 defeat against two-time world champion and world number four Gary Anderson in the last four, although only after Cross missed match darts. 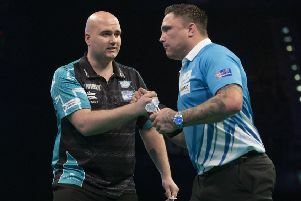 Anderson went on to beat Jeffrey de Zwaan 6-2 in the final. The victories were sufficient for Cross to secure his place at the Coral UK Open TV Finals at the Butlin’s Minehead Resort next month. Cross will hope to get several more wins under his belt in UK Open Qualifier 5 tomorrow and Qualifier 6 on Sunday before returning to Premier League action next Thursday. Another local player, Shayne Burgess, was beaten 6-4 by Terry Jenkins in his opening match at UK Open Qualifier 4.